During the release of Arrambam, on October 31st, Ajith wouldn't be in Chennai. He would be away in Hyderabad for the shoots of his next release, Veeram. 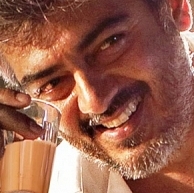 Ajith would be in the 'City of Pearls' from the 20st of October to the 5th of November. Even during his previous release Billa 2, Ajith was away from the city shooting for Arrambam in Mumbai. Veeram is being targeted for a Pongal 2014 release. Siva directs this mass entertainer which features a plethora of established actors such as Tamannah, Santhanam, Vidharth and Ramesh Kanna, to name a few. People looking for online information on Aarambam, Ajith Kumar, Arrambam, Billa 2, Veeram will find this news story useful.